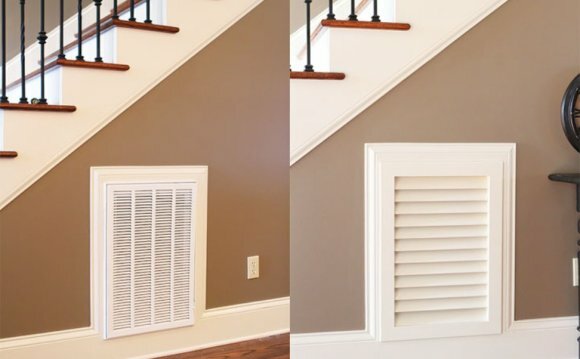 When it comes to the final details and character of any home, your air vents should not be left out. Architecturally speaking, these items can be as beautiful as any other element in your home, thanks to the innovative teams at SteelCrest. SteelCrest produces a full line of decorative air registers, access and control panel boxes, cabinet/window/door inserts as well as architectural panels made of stainless steel that is powder coated to last for years! These products are sold exclusively through decorative hardware showrooms and we are very proud to be able to offer these beautiful architectural pieces for your home. The SteelCrest team consists of a collaboration of HVAC contractors that had a hard time finding decorative vent covers for their clients and in special sizes so they did the next best thing… started their own company! SteelCrest is based in Arizona and every element is made in the U.S.A.! We invite you to start dreaming and planning for your decorative air registers or cabinet inserts today! This series is the most flexible in design as it can be sized to your exact needs and in any finish offered. These products will work with all accessories available. There are over 30 patterns to choose from in this series! If you are looking for a sleek design for a contemporary or modern home, this series is for you! This is where YOUR DESIGNS can come to life! If you have a pattern or logo that you would like on your HVAC products or for cabinet inserts they can be created within this series! Do you have something that needs to be hidden but still have access? Decorative Hinged Access Panels can be made in any size (or 14 standard sizes) and up to 30 different patterns with accessories. Recessed Control Boxes are perfect to tuck away your HVAC controls available in standard size and finishes. Once you have chosen a beautiful pattern for your air registers, why not use the same design in your kitchen or within a specialty door within your home with steel patterned inserts? They are produced in any size, any pattern and any finish available. If you have a custom design in mind or a logo it can be done! If you are ready to begin adding these products to your home or project, please contact us or complete the form below and we will be in touch with a preliminary quote or to schedule a time to discuss your needs further. If you need assistance with a complete home project, we will often work with your HVAC Contractor or General Contractor to obtain the details needed for larger projects. If this is the case, please select this option below and provide your contractor’s contact information below so that we can get started right away!